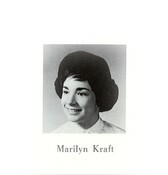 Marilyn Kraft Goldsmith passed away May 29, 2012 of lung cancer. The funeral will be held May 30th at Ira Kaufman Chapel at 2:00pm. The family will be at the home of her daughter and son-in-law, Halley and Mark Uzansky through Friday.